Why is the Russianside, called the Russianside? One of my earliest memories as a child was my mother bringing us off on a Sunday afternoon to visit our Nanny in the Russianside. It was a smaller place then. From the cross roads you passed the homes of Martin Nugent, Joanie Hanlon, Andy Lannen and Nellie McDonalds, all on the right as you walked along. At Nellie’s there was a laneway to the right that brought you over to Powers fields and down a boreen to Ryan’s quay where at that stage a lady who had returned from Rhodesia named St Ledger lived. The road just continued to the left at Nellies and Mrs Ferguson and her “boys” Charlie and Tom were in the house on the right. Nanny was on the left with “Uncle Christy” and coming towards the Strand there was a lovely old barn and farmyard on the left and below it on the right lived Pat and Margaret O’Leary and family. Nothing was made of the name, and I don’t remember ever thinking of it as strange or odd, or to even think of asking where the name came from. It was a matter of fact affair. The Russianside just was. Unremarkable, save for Nanny; where we always wanted to go, where we always felt special. At some point in my teens I remember being in Nanny’s company when a visitor asked where the name had come from. As I recall, she said that locally people said it had a connection to a Russian ship, but the details she was hazy on. She always did say though, that even as a child she remembered the fishermen taking a short cut through the yard when the wind was North West. They had moored off their punts on the “Russian side of the village” Subsequently I have heard many different theories, and I have passed them on when asked but always with a grain of doubt or uncertainty. Some have said that a Russian ship sank off the Russianside, and the sailors were buried along the strand. Interestingly enough Irish Wrecks list dozens of ships that sank in the harbour area, but none seem to have a Russian name. Others have said that as many as seven sick sailors perished aboard ship and were subsequently buried on the strand. I’ve never seen any bones unearthed, and I walked the strand almost every day as a child and at least once a week as an adult. Illness is an age old concern with ships what with plague in particular. But again this is highly unlikely. Waterford, like many harbours you see, had their own isolation stations, such was the fears about diseases spreading from sailors. Ships entering Waterford had to declare any sickness to the “Hospital” above Passage East and sick sailors were rowed ashore and monitored. It appears to have been strictly monitored, The memory of the black death and other endemics probably ensured a strict enforcement. Another account was that the Russians were refugees who were fleeing persecution in Russia and were put ashore to look for safe haven. Stories of the Russian pogroms against Jews do come to mind. Between 1881-4 there were over 200 incidents, but these dates would correspond with my Grandmothers Grandfathers time Bill Malone. She knew him, and any Jewish refugees would most certainly have been known to him. As a consequence I would imagine she would have heard some first hand account. That she didn’t would suggest that this is also unlikely. I have also read of earlier pogroms, at Odessa for example in 1821. I contacted the Jewish Museum recently to see if they had any knowledge. I was delighted to get a very quick and courteous response, but not any information to corroborate such a theory. The final theory that I have heard comes from a good friend from Carlow, via Dublin, Boston, and heaven knows where else. Bob the scientist thinks its an Irish name, corrupted and anglicised from the Gaelic “Ros an Sidhe” For him this comes to Headland of the Fairy Folk. I think Christy Moran would have approved. Now we have talked about the Fairy Folk of the Sidhe only last week in relation to Cheekpoint or Rinn na Sidhe. Is it possible then the Russianside and Cheekpoint are both one in the same? Its possible and indeed probably. But who will ever be able to say for sure. Canon Power went with the Russian sailor story though! Which might be well as the blog is just gaining some traction in the federation! Cheekpoint is both a village and a townland, and for many’s the year there has been two explanations to the origins of the name, a practical, geographical placename and what is probably best described as a romantic version. The name Cheekpoint derives from Pointe na Sige or in other cases Rinn na Sige. Sige, phonetically is pronounced “she-ge”. According to Canon Power, and his book the Placenames of the Decies, the name derives from the river that flows past the village, and in particular the eddies and currents that are caused as the river flows over the Sheagh (pronounced she-egg) rock, which is an outcrop at the Mount, below the village. As the tide flows over the rock it causes a distinctive streak in the tide, which the learnered priest considered the origins of the placename, the point of the streaks. Its hard to discount the theory, as you can see from the photo a streak is very distinctive, and indeed locally we call this, to this day the Stroke. It’s slightly different to the streaks that are caused as the tide ebbs over the rocks. However it is easy to see where Canon Power was coming from, that the first settlers to the village would have come by water and would have named the landing point by a distinctive riverine feature. Against that however, is the fact that strokes can be seen in the river at various spots and at all different times of tide. And rocks and outcrops cause eddies and marks in the river at other locations too, such as the point light, Snowhill, etc. To be honest, to a fisherman there’s nothing too special about the river as it flows there, except for the strength and flow of tide. Of course the romantics prefer a more elaborate origin. The gaelic Rinn na Sige may also suggest the headland of the fairies, or the fairy folk. Interestingly the Loganim site records a reference to “the landing place of the fairies” Si, Siog or Sidhe (which is very close to the phonetically spelled Sige above – “She-da”) suggests a connection to the other world or fairy folk, The Sidhe were a mythical people who were thought to have been the first settlers to Ireland and were defeated by the coming of the Gaels to Ireland. The disappeared into mounds or hills but emerge in times of need. Their ring forts and fairy paths still exist and to interfere with them is a cause of great harm to an individual. I was reared on such stories in the Russianside, particularly by our Granduncle Christy Moran who, if he didn’t believe the stories must have been a great actor. Now the reference to a landing place provokes another speculation on my part. My cousin Jim Doherty passed on a newspaper article from the mid 19th C which attributed the coming of an ancient tribe to Ireland via the harbour and which landed at Cheekpoint. Cesaire, Granddaughter of Noah, built an ark to carry her and her lover Fintain and fifty followers. They left 40 days before Noah and at his direction sailed west. According to the story, they landed up after much adventures at Cheekpoint, at the confluence of the three rivers and there they settled. In time Cesaire died and was buried at the foot of the Minaun. The book of invasions has a similar story, but without Cheekpoint! Is it possible that the placename Cheekpoint, anglicised but still retaining is older origins may hint at a much more ancient past, a past that includes remnants of the foundation story to the earliest settlers in this area? We may never know, but what I can say for certain, that the location which was of such strategic importance in the centuries past must have a lot stories yet to be brought to the surface. I guess the version you prefer depends a bit on your personality. But as a certified romantic and dreamer, I have to say I tend towards the version that includes the Sidhe! I was never great at school. But one specific class I can remember as a highlight was a lesson one day on placenames. I don’t recall if it was a planned session, or if it was an aside. But Michael White who was principal at Faithlegg was talking about how important it was to appreciate the Irish language, when it came to an analysis of the origins of placenames. He gave a brilliant example, Knock Boy or in Irish Cnoc Bui. The cartographer obviously hearing the name spoken in Irish tongue, completely twisted a beautiful geographic description of Yellow Hill, to a totally irrelevant English language replacement. I found the translation, of what in my minds eye was a hill festooned with in-flower gorse, and that heady coconut like smell on a hot day, an insult to those who had gone before. The townland I was born and raised in is called Coolbunnia. Its a strange enough name, and not one I have come across elsewhere. For some reason our area doesn’t seem to fall neatly into so many of those obvious Irish placenames such as Rath, or Ard or Dun. Mind you we do have a Kil. Canon Power in his Place Names of the Decies decried the fact that during his studies that native Irish speakers were not to be found in our area. No surprise in a Barony called Gaultier; land of the foreigner. With so much settlement and trade, the pressure on a native tongue must have been pronounced down the years. For the learnered priest then, Coolbunnia, despite the fact that he didn’t have a native speaker to pronounce it, suggested to him the “Ridge back of the stream” The Stream I have always thought is that which flows from below Everetts, now Malachy and Michelle Doherty’s. It flows down to the left of the road as you drive towards Faithlegg and flows under the road at the “bridge” and then down the Glen and to the Suir. The stream rises in the fields below Malachy’s and in years gone by a well was oft used to quench your thirst, fed from the source. The ridge in this context of course is the Whorthill which winds its way towards Passage high above the estuary. According to Power it didn’t actually exist at the time of the Down Survey. Then the entire area was known as Faithlegg. 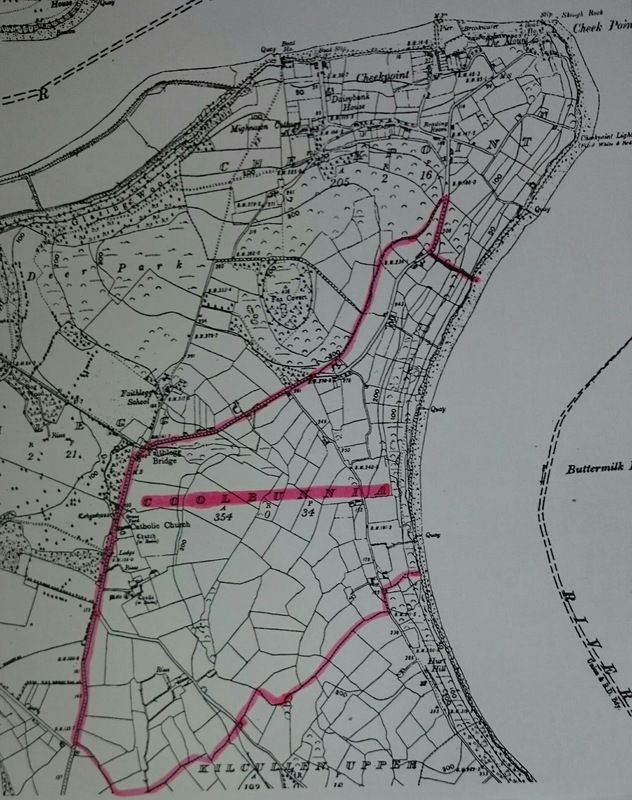 So sometime in the past two hundred years we have had the two local townlands added, Coolbunnia and Cheekpoint. The following map highlights the extent of it, spreading from Tom Sullivans to the ditch at Vic and Eileen Bibles and from there back to the River. Of course Canon Power could be wrong. He spelled it Cúl Buinne. But the Irish placenames site, Loganim considers it Cúil Boinne. The Cúil in this case is considered a nook or a corner, They also provide several other spellings including Couboyngne and Coolbunna and interestingly the name Coulboygun is dated to 1313. Another interesting fact is that it’s the only Townland placename of its kind in the country. I often wondered if I had picked up more Irish would I have had an advantage in deciphering placenames. But for the last eight years I have sat beside a native Irish speaker in work and she has reminded me several times that such queries are the gift of specialist people, so many complexities and variations are involved. So I can let go of that bit of guilt anyway. But there is another Ice house in the area, much bigger, yet more accessible. Lets call it Jack Meade’s Ice House, though we could as easily call it Ballymaclode Ice House as it resides in that townland. Its circular in build, approximately 20 ft in diameter on the inside and over 30 feet high. The wall to the South, which would have taken the most sun was six feet wide in the past, and was a cavity construction. The roof was thatched and entrance was via the door near the roof, and accessed no doubt from the present garden of the Kenny family home. I’ve long entertained a notion that the Ice house, as big as it was, must have been built with the coming of the Scotch Weirs in the early 19th Century, which gave rise to the Salmon Wars or the weir wars later in the century. The Barony of Gaultier featured an article about it by Ray McGrath in their latest newsletter. Originating in Scotland, the practice exploded with a new approach to the preservation of salmon, the use of flaked ice. Previous attempts to use ice was found to be problematic, a fish when placed on a block of ice, fused with it and the flesh of the fish was damaged. The new approach which was brought from China in the late 18th Century, saw the ice being chopped or flaked and then the fish being surrounded by it. The fish were thus preserved without damage…the Chinese had been doing it for centuries 1. 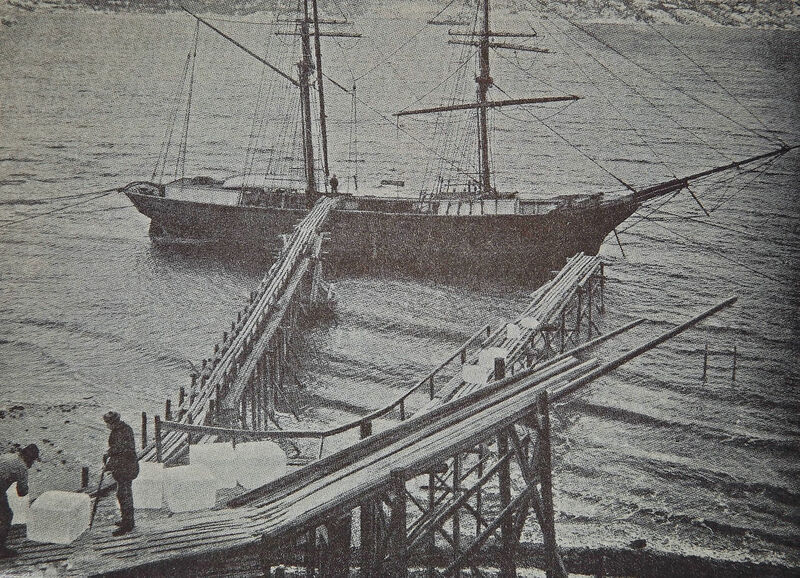 This new technique, coupled with developing rail transport, meant that fresh salmon could now be delivered to the rapidly expanding industrial cities, especially London, where fresh salmon had long been prized, but was hard to get. The new technologies and the new markets saw a rash of weir building, with little or no regard to the centuries old traditions of traditional nets men and “head weir” men such as had existed since at least the coming of the Cistercians to Waterford harbour. As a consequence of the demand for Ice a new trade was developed, apparently initially in America but it eventually spread to Europe, who could naturally depend on the Norwegians for a ready supply of cut blocked ice. This was transported on sail boats to harbours such as Waterford and then carried along on lighters to Ice House locations such as at Jack Meade’s. Straw or sawdust was used as an insulator between the blocks. I’ve found little enough evidence of Ice House use in Waterford, but it was stored in basements all across England, and I have no doubt it was likewise stored in the city and New Ross. I wonder however, did Jack Meade’s Ice House pre-dated this era? Looking at the design and the fact that it had a thatched roof, it’s possible that it was an earlier build, and if it was, it most probably served the big houses that were in the area. At a stones throw I can think of Ballycanvan House, Foxmount, Brook Lodge, Mount Druid and Blenihem. I’m guessing that just like at Faithlegg, the landowners of the area, chose an ideal location to harvest ice from Ballycanvan Stream when the weather was right and to deposit it into the ice house. It could then be brought to the homes of the rich to impress guests with chilled white wine or sorbets in the height of summer. It could also be used to store a large quantity of perishable goods. Meat and fish etc could be suspended from the roof beams above the ice and be preserved long after they would have turned in normal circumstances. There is a story of Ice blocks coming up the pill in Lighters, so it was to see this trend emerge, and it’s probably that like an “Ice Box” I have located nearby with the assistance of Pat Murphy, that it did play a part in the Scotch Weir developments.